Visit The Jungle Jointe Today! The Jungle has had many, many, jungle avatar animals visit since it opened. The role playing seems to come very naturally for our jungle friends. We have decided to create a group for all jungle avatars. We find running through "The Jungle" and chasing our visitors to be very rewarding. Playing with the children and watching them giggle warms an animal avatar's heart. "The Jungle" is very dense with many hidden pathways and places to explore. You can not possibly see "The Jungle" in one visit. There are many things to do for both humans and animals. Taking one of our boats through miles of jungle rivers lets you see how beautiful and magical this sim is for its visitors. 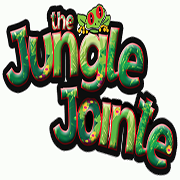 Guides are kept on hand to answer questions and point the way to the many sights to be found at "The Jungle" "The Jungle Jointe" hosts top quality entertainers on Sunday evenings starting at 6pm SLT. The incredible Clarice Karu followed by the heart stopping Trav McCullough pack the "Jungle Joint Club" on Sundays! There is so much to do at "The Jungle" we could not possibly list it all. Take the Time to COME TO THE JUNGLE I promise you will not be disappointed!! !